What some are calling “Right-to-Work” is a proposed law that sounds great, but in reality is deeply controversial, confusing and would cost West Virginia families on average $5,000 a year. This law has been pushed on our state government by out of state millionaires and billionaires who are trying to make more money off of our families. The rule would allow workers who choose not to participate in a union to benefit from union-company contract negotiations without ever having to pay a single penny for the collective bargaining services. Proponents like to say that this makes states more attractive to businesses, but of the 10 states with the highest unemployment rates, 7 are “Right-to-Work” states. Proponents like to say that this makes states more attractive to businesses, but of the 10 states with the highest unemployment rates, 7 are “Right-to-Work” states. This proposal is political overreach at its worst! – The government shouldn’t interfere with agreements made between employers and employees. 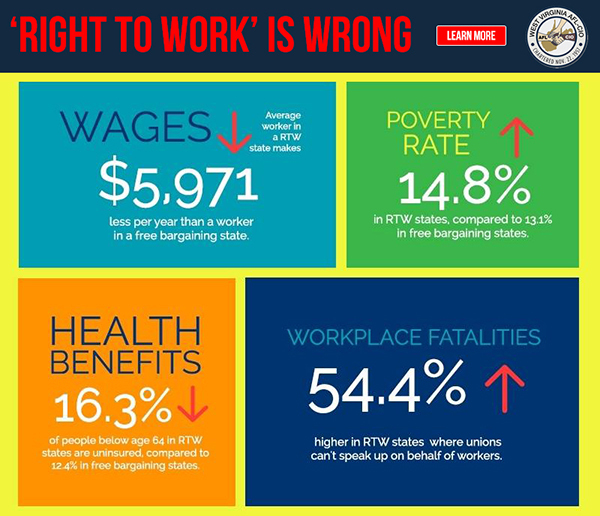 “Right-to-Work” Makes our communities less safe too. – “Right-to-Work” makes it harder for Fire Fighters to negotiate for the equipment they need to put out fires and nurses to negotiate patient loads at Emergency Rooms. If Firefighters and Nurses can’t negotiate these things, it means they may not be prepared to protect us in an emergency. “Right-to-Work” will put retiree pensions in jeopardy. – West Virginians who have worked hard all their lives should not have to worry that the company they work for will run away with the pensions they promised. Put simply, “Right-to-Work” is an attempt by out-of-state interests to move us to part-time positions, off-shore our jobs and reduce safety in the workplace.